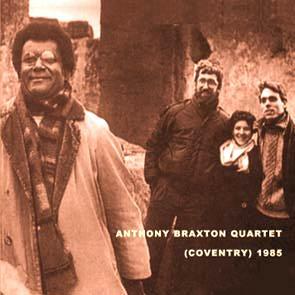 Recorded on the same tour as Quartet (London) 1985 and Quartet (Birmingham) 1985, also documented in Graham Lock‘s book Forces in Motion: Anthony Braxton and the Meta-Reality of Creative Music (A/K/A Forces in Motion: The Music and Thoughts of Anthony Braxton). This was the final show. Supposedly the group made an extra effort to perform well in that last tour performance for the benefit of the recording. Braxton had by this point clearly broken away from the sorts of things he was doing with his first great quartets with Altschul, Holland and Wheeler or Lewis in the previous decade. His compositions and methodologies had undergone great changes too. Each musician has a “territory” specified beforehand by Braxton, which serves to facilitate interaction and provide a starting point, but ultimately there is no limit on what each performer can do in his or her territory. Like composer Ruth Crawford Seeger, he was also using material that could be played simultaneously — he called it coordinate music. In hindsight, these methods laid the foundations for the more elaborate renderings of Braxton’s Ghost Trance Music of the next decade. This double-CD set also includes recorded interviews between Braxton and Lock used as the basis for parts of Lock’s book. The cover photo is of the quartet at Stonehenge, with Braxton wearing one of Evan Parker‘s old coats because he absentmindedly forgot to bring one of his own for the tour.